Schwal is the name of a gathering place for German emigrants on their journey to southeastern Europe. From here, the boats to Vienna took off. Schwal used to be the central point of departure for many emigrants. It is located on a small island in the Danube on the shore of New Ulm. Here, the “little” and the “grand” Danube come together. 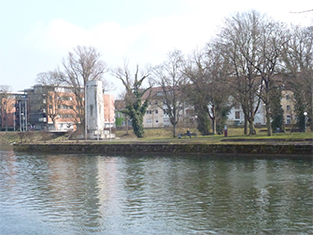 The island belonged to the free city of Ulm until 1802 and was used as a shipping site. Furthermore, it was used to secure the Danube passage. In the eastern part of the island, Schwal is located. Close to the island on the western shore of the Danube, the workshops producing the Ulmer Schachteln (ships, literally: “Ulm’s boxes”). In 1930, the island was made accessible to the public. Today it is a memorial site with an impressive war memorial created by the famous sculptor Edwin Scharff in 1933. A plate reminds one of the river's impressive length from the island to the Black Sea: 2586 km. The island is also worth visiting for its beautiful view of Ulm’s cityscape which invites to a moment of peace during the summer. The island on which Schwal is located lies between Ulm and New Ulm and belongs to Bavaria since the 19th century. 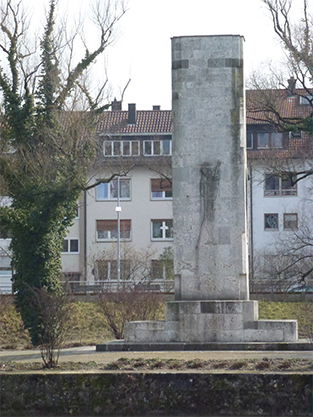 The war memorial, created by Edwin Scharff in 1933.